The conflict between the brothers will remain a focal point in season two. “I don’t think they’re relationship will ever be the same,” Fimmel said. Fans will certainly be hoping for more big showdowns like the one in the clip between the two warriors. This may have to happen quickly as the series is planning a time jump within the first few episodes. Creator and writer Michael Hirst assured panel attendees that season one cliffhangers will be addressed prior to the fast forward. We will also see Lagertha and Siggy (Jessalyn Gilsig) grow closer together over their shared grief for their children. Both actresses see their characters as great representations of strong, courageous women. Lagertha especially has shown herself to be a fierce shieldmadien. How will she react when she learns of Ragnar’s new mistress? Winnick isn’t spilling any secrets but a famed fighter like Lagertha isn’t going to take the news easily. Joining the cast for season two are Alexander Ludwig as Ragnar’s now grown-up son, Bjorn ,and Linus Roach as Ecbert, King of Wessex. 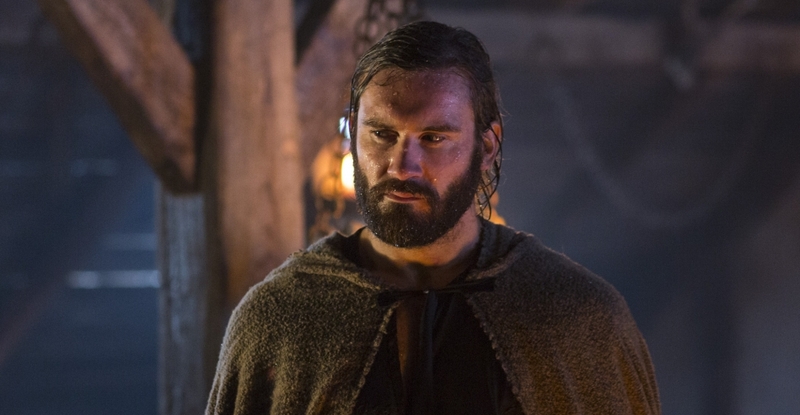 The 10-episode second season of Vikings returns in 2014.